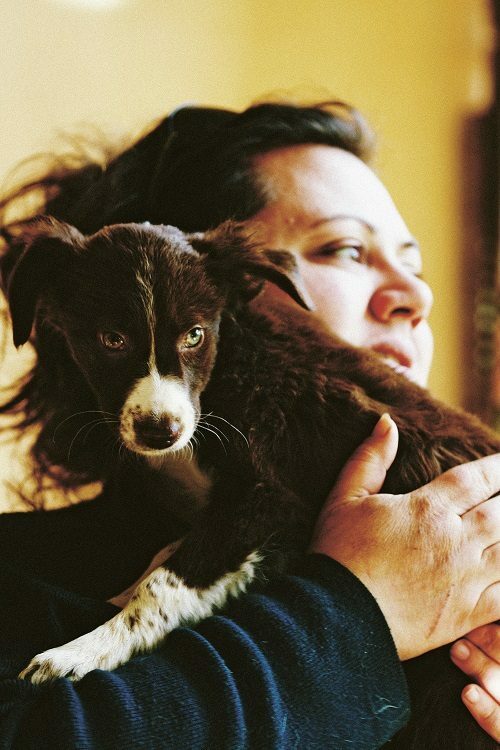 Before Claire Lloyd moved to Greece she had little time for animals. She admits lived in a whiter than white environment. She dressed in white. Her floors, walls and even furniture were white. She underwent a seismic shift when she moved to the island of Lesvos. As I write this there are three cats inside the house. My special one, Sweetie, who is queen of the house; Mikraki, a small ginger cat, and Grey Bear, a cantankerous old tom with three legs. In the garden are the dogs. Nellie is asleep in her basket and Hector on the welcome mat. Outside the gate a handsome, high-spirited young male dog has just appeared, probably dumped by a passerby. Although there is no sign on our door saying ‘Critters with any issues – abandonment to starvation – welcome’ our home has become a refuge, and our days are filled with feeding, medicating, playing with and rescuing them. It is impossible to ignore their plight. Greek people don’t view dogs as pets on the whole, but as working dogs, good for guarding and herding, otherwise they are viewed as an expensive indulgence. Neutering their dogs is not an option as few have enough money to spend on such things. The end result is a slew of unwanted litters, most of which die from lack of food, disease or poison. My partner Matthew and I have been doing our best over the last 7 years to care for and re-home as many dogs as possible. Most have been re-homed in the UK and Europe and two have gone all the way to Chicago. Having watched them recover, get stronger and begin to play and romp, it can be very emotional saying goodbye, I sob a lot, but know they are going to loving homes where they will be happy. I am thrilled when people send me pictures and mini films of the dogs in their new homes. Recently at my London book launch for My Greek Island Home, a group of rescued dogs came to help us celebrate. It was a joy to see them again. One of my Greek friends who rescues dogs and has 25 in her care told me that it was important to harden our hearts otherwise they would be broken. It’s very tough not to be able to help every single one but we do our best. We are lucky to have generous friends, Nikki Tibbles and her charity the Dog House is one such staunch supporter, and this has helped us find good homes for our rescued dogs. There are also other animals who befriend us. My newest animal friend is a donkey whom I meet on my morning walks. Artist, designer, author and photographer Claire Lloyd for many years enjoyed a phenomenal career in London, juggling the fast pace and high pressure of work with travel and excitement – until glandular fever suddenly stopped her in her tracks. During her recuperation Claire determined to restructure her life. A chance conversation led her to the Greek island of Lesvos, where she finally found what she was looking for – a sense of peace and the return of her creative drive. Her new book ‘My Greek Island Home’ describes Claire and partner Matthew’s days in this small Greek village, where the seasons govern a way of life that has barely changed over thousands of years. Accompanied by Claire’s stunning photographs, this inspirational story of discovery, building a new life, reconnecting with nature and community, a new-found love for animals, and finding beauty in the smallest details, will make you see the world afresh.